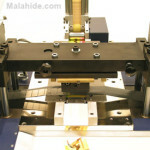 Cards begin their journey through the E4-PC by first being stacked into a vertical stack mechanism. This stack holds about 300 cards. 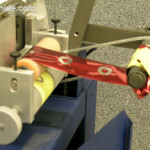 Cards are fed by a series of rollers from the bottom of the stack, and then individually moved down the tracks to a pre-stamp staging area (figure 1). 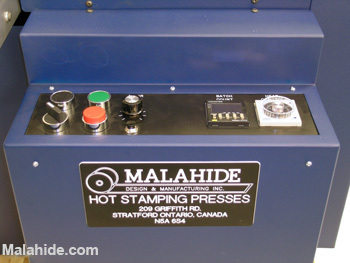 On the next cycle, the card is moved beneath the print head and then hot stamped. 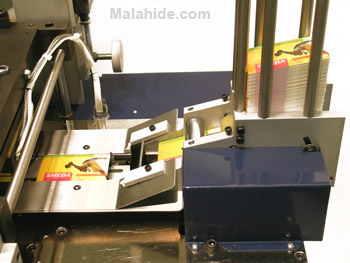 Once stamped, the card is discharged onto an incremental conveyor belt (figure 2). 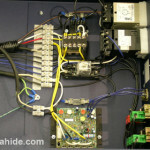 The E4-PC is an all-electric machine. 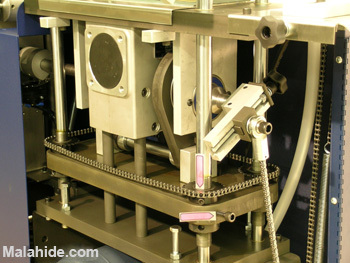 One central CAM mechanism supplies mechanical power to the entire machine. Smooth and precise, all bearings and parts are purposefully oversized to ensure long life and durability. 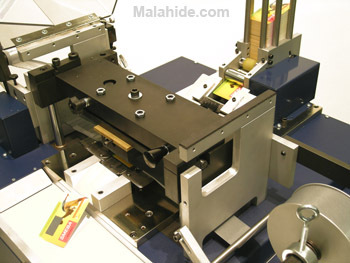 The E4-PC generates up to 8 tons of pressure, more than sufficient power to produce dazzling foil stamped cards. 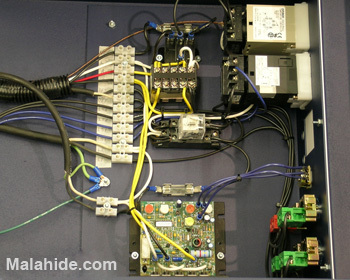 An all-electric machine, the E4-PC uses an electric motor as its power source, not pneumatics like most other hot stamping machines. This means that with the E4-PC, you don’t need a high-end air compressor, plus you eliminate 100% of the many inherent issues of pneumatic equipment. Furthermore, the E4-PC runs cleanly and quietly, making it suitable for use in a home or office setting (figure 3). 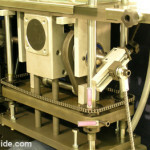 The CAM mechanism powers the print head, pulling it down from all four corners. This results in an even dispersion of pressure. 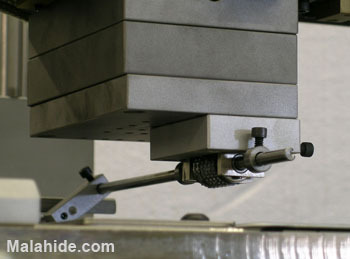 A central heater runs the full length of the head to ensure even heating (figure 4). 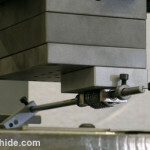 Four leveling screws on the top of the head allow for fine adjustment (figure 5 ). 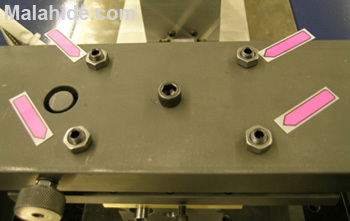 A central pivot allows one to rotate the head 5 degrees each way for fine alignment of the die to the card. 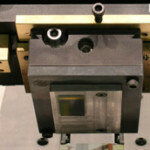 The E4-PC is delivered with a 2″ x 3.5″ die holder. 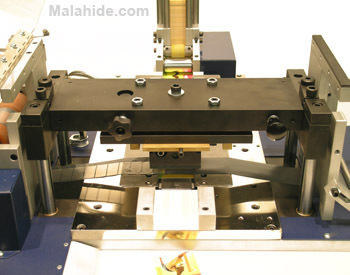 Although the chase of the E4-PC can be configured to accept a wide variety of existing die making systems, we recommend you use 11 point magnesium dies. 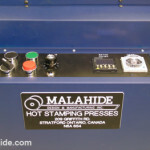 Dies are trimmed to 2 x 3.5″, drilled with locator holes, and then screwed onto the heated platen in 2 places. The purpose of screwing plates to the chase is to enable one to precisely locate multi-colour artwork in relation to the mounting holes. 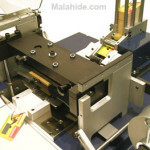 This rigidity of location significantly simplifies the set-up and registration of multi-colour jobs, while also keeps the die securely in place during stamping. 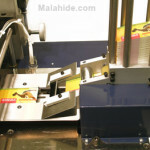 Produced by an outside diemaker, die plates are chemically etched in vats of acid. 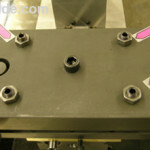 Durable over thousands of impressions, and lasting for years, dies plates cost about $2.00 / sq”. 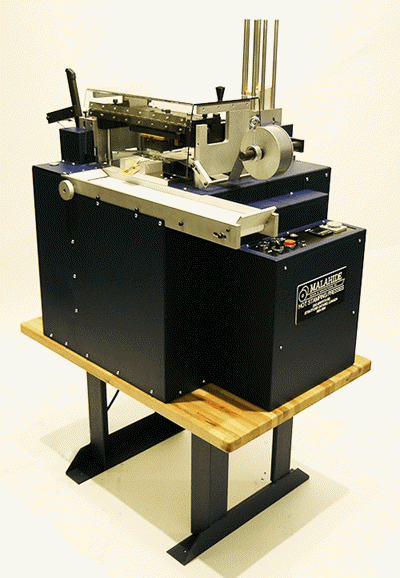 The E4-PC’s standard foil feed accepts foil of 1″ ~ 3″ wide and up to 1,000 feet long (figure 9). All rolls should have a 1″ core. 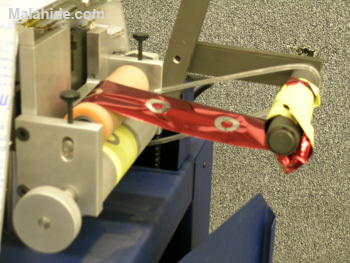 The foil feed offers adjustable spacing between images. 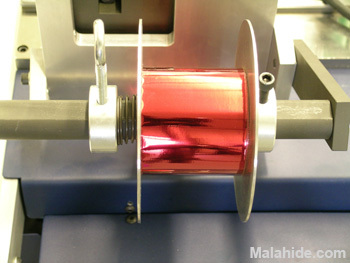 The example below shows the precision of the foil advance system (figure 10). 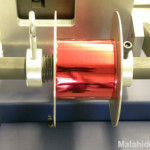 To maximize foil consumption, the E4-PC can pull as little as 1/8″ between 1″ images. 1001 , 1002 , 1003 , 1004 , 1005 . . . Using a center-driven numbering unit, these devices are available in Gothic or Roman fonts @ 2, 3, 4, 5 or 61/2 Cicero tall, and 6 or 7 digits long. Malahide Specifications & Pricing for E4-PC: Malahide by Spartanics E4-PC. For more information on how Spartanics can provide a solution for your specific needs, please contact us by filling out our ‘Contact Form’ or call us today +1 (847) 394 – 5700.